Very cute! Looks great in my back yard! Easy to assemble. Comfortable to sit on. Love the looks! Totally worth the price! Would recommend this product. This Estero bistro set from Simple Living will bring the old-world sophistication and ornateness of a Parisian street cafe to your back patio or outdoor dining area. This set includes a bistro table and two chairs, all made of weather-resistant metal with a gorgeous vintage copper finish. 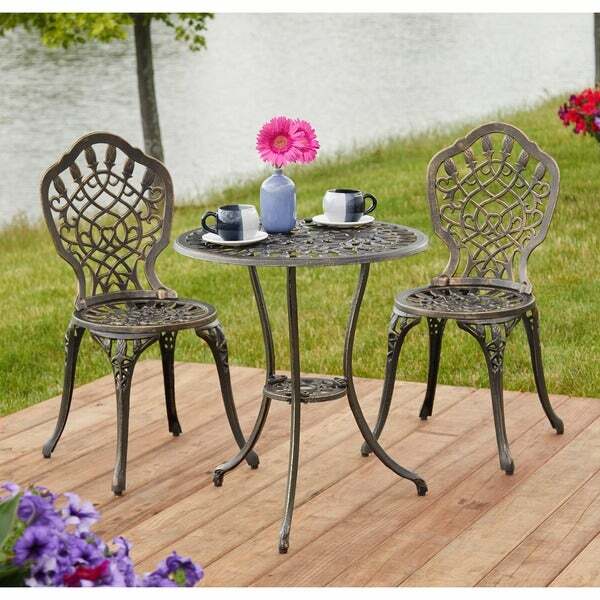 Hi, I had been wanting a Bistro Set for off and on now for at least 10 years, No kidding ! 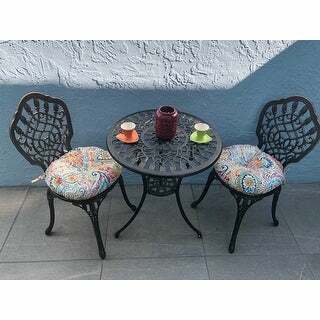 I had never been able to find one that i really liked, so Not long ago i was looking at my OverStock.com store, when I just so happend to run across there Bistro Sets (wasnt looking or even thinking about getting one at this time) I saw this very exact Estero Bistro Set and i lookd at the picture and thought to myself, thats kinda cute and I thought you know what the price isn't bad so you mite as well get it , your not ever going to find one you like thats both really pretty. AND affordable..,I ordered this exact Bistro 3. Thinking. I would get it in 3 weeks if I was Lucky..Well my dear Fellow shoppers i got it in 7 or 8 DAYS, !!! YES 7or 8 Days! I had to wait awhile for my Husband to getting around & putting it together and plus with all this rain and storms we've been having the back porch needed a good cleaning so have to wait even longer.....WELL husbi put my Bistro Set together THIS past Saturday evening AND FOLKS. Let me tell you what, I absolutely LOVE IT . Its Beautiful the design the color PLUS PLUS its Heavy extremely well made this is very IMPORTANT as most of my family is over weight ( i have had serval outside chairs break with me setting in them only to end up on the Ground and getting my back,arm,hurtting super bad for 3 or 4 days) NO WORRIES WITH THESE ! !VERY IMPORTANT PART MY HUSBI SAID TIHIS WRENCH THEY GIVE YOU AINT WORTH A D... THING FOR NOTHING AND THAT WAS ALL HE SAID EXTREMELY QUIET AND PEACEFUL PUTTING THE BISTRO SET TOGETHER, never in almost 41years together has this ever happened BEFORE, before it was ALWAYS CARRYING ON AND MUMBLING BEING GROUCHY But not this time , Nosirry. This Estero Bistro set is HIGH QUALITY thats made Affordable. ALL SHOPPERS NO MATTER WHAT THIER FINANCIAL STANDING IS OR NO MATTER THIER ETHNIC. THIS ESTERO BISTRO REALLY IS FOR EVERYONE!!!!!!! Thank you. This was an inexpensive bistro set so we didn’t have high expectations for it, but it was easy to assemble and looks great on my patio. Great choice if you have limited space. Love my little bistro set! It is of good quality and heavy. It was fairly easy to assemble. I keep it outside and it has not rusted or become discolored with the rain. Once completed, this set looks great and I am really happy with the sturdiness and function. I love how this set completes the small garden patio I put in just to feature this set. The assembly process was the only issue I had with this purchase. I was thrilled to receive all of the parts and pieces especially since the screw package had come open in the box and I was afraid that some may have fallen out in transit. The other issue I had was in the base portion and leg attachment. The pre-drilled holes did not line up quite right and it took a bit of wiggling, tugging and adjusting to get the table together. This set can be assembled by one person, but as far as the table goes, I recommend not tightening everything up until you get the table completely assembled, then go back and tighten all the nuts and bolts. The chairs went together like a dream (follow the instructions and don't jump ahead, the backs do need to go on first). All and all this is a great little bistro set. It is sturdy, once fully assembled, and looks cute. The finish I chose is nice looking, too. I feel that it will last outdoors for years. I am happy with this purchase and the price was good for this type of metal furniture. Lovely little bistro set. Easy to assemble and very sturdy. Unique flower design. Perfect for a small space, yet enough table surface area for 2 coffee mugs and cake plates :-). I would definitely recommend this bistro set. This table and chairs is very good quality. It goes together easily and I did it alone. Excellent Bistro set. This bistro set is perfect for a small space indoor or outdoor. We used it for a table in the kitchen area to eat and have a more intimate space. It is perfect. You need sometime committed to assembly. It took about 2 hours. Perfect for a small balcony. Assembly takes time but not bad. Center piece on table near bottom didn’t fit right side up but I flipped it and it seems to be fine, would have preferred this to be right side up. Pretty easy to assemble, and love it on my front porch! Definetely would encourage others to purchase this set. I purchased it for my kitchen and its perfect. Takes up little space and very sturdy. Im thinking of buying another for my porch. Very sturdy, should take weather in Tahoe. Color of dark bronze goes well with condo’s exterior colors. Love this bistro set. It is stylish and affordable. It looks fantastic in my sitting area just outside my bedroom. I would totally recommend for anyone. This 3-piece bistro set is absolute garbage. When it was first received it came with a broken chair leg, they did send a replacement piece but I now wish I would have just sent it back in the beginning. When putting the table together, nothing lined up, the top is completely warped and the center brace cracked in 3 places. The chair bolts immediately stripped when tightening. And nothing sits level. I am pretty sure that it is not safe for a child to sit on, let alone an adult. This item doesn’t even deserve 1star. This set is great! Sturdy and good quality. The color is more of a bronze shade, it is hard to tell online. We get lots of compliments on it and would definitely recommend! Just what I wanted, nice lil settee for outside, nice quality, easy assembly required, 15" round cushions fit the seats perfectly, coffee on the patio anyone! "How "low" is the bottom piece? Wondering if our current metal umbrella holder will work under this set since one person noted this was a very low space... Would be nice if you had included it in the description of this set..."
well it is very low ,i don't think it will hold an umbrella ,its more for just the look ,you see i had mine on the front of my from porch and we never seat on it!! ! !hope it help!! "How much weight will the chairs hold?" The set is very sturdy, but small. I would worry more about the comfort and fit than the sturdiness as it is very good quality. But a person with large bottom would not be comfortable. "What size cushions fit these chairs?" great price and the design so beautiful. it fit and nice to place in front house fr early morning tea time. "what is the weight of the table?" The weight of the table is approximately 15 lbs. "ok table is low so what kind of umbrella brace do i need to purchase Any idea on heigth for it TKS ive never owned a patio set so im depending on advice thank you"
I own this set also and found the height of the lower umbrella circle to be 11 inches from ground to circle so a 10 inch or so base height needs to be purchased. Sturdy set , we like it .